It’s up to Sam Hell and the armed and dangerous beauty Spangle to brave the barren wasteland once known as Earth and ruled by slimy, green overgrown amphibians. This is a difficult movie to wrap my head around. It definitely feels like a low budget movie that a bunch of buddies made on an abandoned factory lot, but then the frog prosthetics show up and look book horribly bad and professionally done at the same time. There’s two types of faces, human-frog and frog-human. 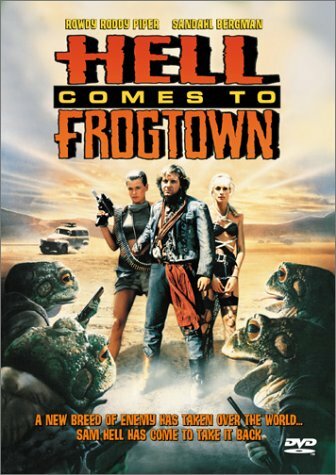 They never really point this out, the plot is too involved with discussing Rowdy Rod’s virility, but it’s such a weird noticeable situation that I can’t help but wonder if they borrowed some of the frog heads from an other movie that had a larger budget. Think Road Warrior crossed with tank girl crossed with A Boy and His Dog. It was a fun movie that wasn’t especially well done.